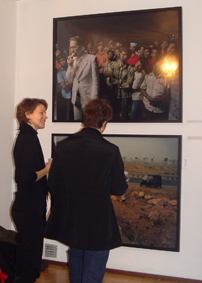 Rererato held an opening reception for India: Michael Cogliantry . Local band Eet provided sitar-studded soundscapes, while patrons feasted on Aaron Silverman's homemade Dal Masala. Incense filled the air, and we were all transported by Mr. Cogliantry to a land far, far away. On display were Mike's large images of his journey accross India in a motorized rickshaw. Also available were copies of his book detailing his trip.